When the winter season rolls in, you know it. The long winter months in New Jersey are commonly accompanied by ice and snowfall throughout various parts of the state. This frozen precipitation accumulates on the roofs of your homes and businesses and can cause serious problems when ignored for extended periods of time. When ice and snow bulks up on top of building structures, they’re at direct risk of ice dam formation and black mold growth. How Do Ice Dams Affect Your Home? Throughout any given winter day some of the snow will melt, run into the gutters, and freeze again over night. This cycle of repeated thawing and freezing starts to form large ice dams along the eaves and gutters of your home or commercial building. These obstructions prevent melting snow from draining off roofs and back to the ground. Nature will take precedence and find a drainage path with the least resistance. Unfortunately, the path that the excess water chooses may journey directly inside of your home – leading to the growth of black mold and its associated complications. Water damage often goes unnoticed for some time until the negative effects are visibly seen, and water buildup inside of the home from ice dams can cause varying levels of structural damage and critical health issues. 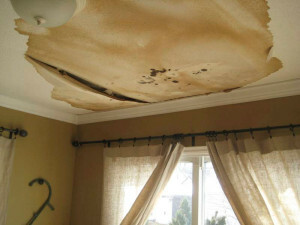 If the affected areas are not treated quickly or properly, the mold can intensify and extra assistance may be needed to effectively repair the water damage. As the melted snow and ice backs up through the gutters and under your shingles, it can seep into the home, causing water damage to the ceilings and walls. Rapid cleanup and dry-outs need to be performed immediately to avoid a very costly mold remediation. To stay ahead, many home and business owners will remove the snow and ice with a roof rake. If you’re not capable of treating the building on your own, All Jersey Environmental Services is prepared to preserve, maintain and restore the building’s baseline, walls and respective superstructure. To effectively cleanup water damage caused by ice dams and melting snow, All Jersey is equipped with the latest state-of-the-art machines to get the job done. Our certified technicians are rigorously trained to identify and remediate any signs of water damage. We can treat and dry any hard-to-reach ceiling crevice, drywall ceiling or sub-flooring. Contact us today at 973-885-8032 for a free quote. We’ll be happy to deliver comprehensive water damage repair solution to your home or business! To learn more about All Jersey and our other health services, please contact us today for assistance or read our blog for more helpful tips!